Nimrod has now been moved to a more secure berth, further into the creek and onto a proper pontoon. It is still stern-to mooring but it is on a pontoon with a gated entrance so the security is better and it is further away from the wash and surge. Being by the breakwater was quite fun with all its comings and goings but it was accessible to all and closer to the entrance of the harbour. 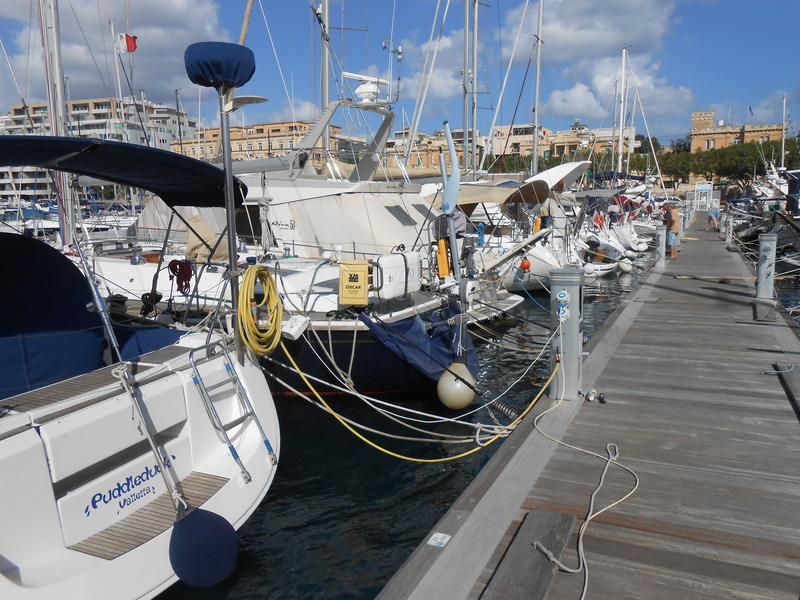 The sails and stack pack have been inspected, cleaned and repaired for the princely sum of €75 for the lot. We’ll know more as to how much of a bargain that is when we go out in 4 weeks time to see her. It does seem that having Peter as our caretaker has made things a lot easier in terms of getting things done and knowing the right people. The last trip brought it home to us that by having Nimmie abroad, we can spend all of our time out there maintaining rather than enjoying her and where we are. Don’t get me wrong, we love doing jobs (as you will all know!) but we also want to be able to relax and it seems that having Peter around will allow us to get the big things out of the way before we actually arrive on the boat. Time will tell! I am sure you made the right decision.